There’s an old saying in investing “no one cares about your money as much as you”. Something similar could probably be said about most hockey players “no one cares about your development as much as you”. Being your own coach is especially important for older hockey players. Sure in minor hockey there are a lot of great coaches, parents and instructors, but even a great coach has about 15 hockey players who they are working with at any given time. Most hockey players get a few hours of practice per week on the ice, and the older the players get the more time is spent with systems and flow drills and less time is spent on skill development. So what is a player to do? Jeremy Weiss from Weisstech Hockey made a good point here that I certainly agree with. Young players won’t be buying skills DVD’s or have the right mindset to become their own teachers, so for coaches and parents of young players it’s important to be a student of the game and also a coach. Stay up to date with new and fun ways to teach skills, continue to watch skills videos and review different coaching resources. A great coach will teach, challenge, and motivate you, but that doesn’t mean you can’t do anything on your own time! As a player you can’t just wait around for someone else to show you how to shoot, stickhandle and play your position. What happens if you get a coach that focuses on systems for an entire year? That would be an entire year where you would not get any help with stickhandling, shooting, dekes, skating, or any other skills. How can you coach yourself? Before you can be a teacher, you first must be a student. This is the most challenging part of being your own coach. In order to teach yourself you first must learn. There are a lot of great hockey resources out there. If you are trying to learn a skill you can look for instructional videos on Youtube (How To Hockey Channel with other channels in the sidebar) or instructional DVD’s (I learned more about stickhandling as a 14 year old from watching Sean Skinners stickhandling VHS tapes than I ever did from coaches). If you are trying to learn about positions there are some good positional articles online (winger, Centerman, Another for wingers) and if you want more than just the basics you can study some hockey books. Some I recommend are Hockey plays and strategies and Jeremy Weiss’s playbook PDF for positioning, and Hockey Tough for great advice on mental training for athletes. You also need to learn about yourself before you can coach yourself. What areas of your game need the most improvement? For example I remember being run through a number of edgework drills. Because of these drills I realized that I was a bit off balance on my inside edge of my left foot when skating backwards and turning. This seems very specific, but it gave me something to work on and helped me find a deficiency in my game and my skating improved even more ever since I focused on that area. This comes along with doing your research. Being prepared means knowing what skills are involved in improving, and how you can improve those skills. I found a great checklist from Hockey Canada that goes over all the skills that an initiation hockey player should learn (ages 4-7). How old are you, and how well can you perform these skills? 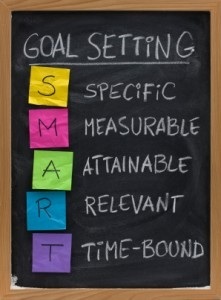 Make a checklist of your own of skills you want to improve! Everyone is motivated differently, the great thing about being your own coach is that you know exactly what motivates you. Maybe it’s a cool video game, maybe it’s some type of food (like a juicy Harveys Hamburger), or maybe it’s just the sheer joy of improving and playing better. Learning and improving should always be fun, if you are doing workouts to improve your leg strength, or you’re running through a series of ladder drills to improve your foot speed why not put on your favourite music and rock out! Invite some friends over and challenge them to beat your times, create some competition, do anything to make your training a little more fun. If it’s fun, you will want to continue training and improving. A schedule is a great way to stay on track when trying to achieve a goal. It’s too easy to say you are going to do something every day only to forget a few weeks later and go back to your same old routines. Sit down and write out a reasonable schedule that fits into your current lifestyle and goals. If you are competitive your schedule might include daily training at home and at the gym. 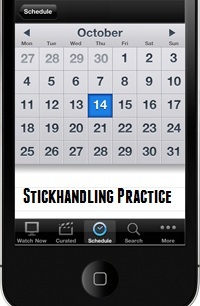 If you are a recreational player maybe you will only include two training sessions per week. The important part of making a schedule is balance. Make sure each area of your game is addressed so you can continue to advance. Don’t be afraid to sit down a few months later and rethink your schedule. That way you can modify your schedule so it will continue to challenge you. So I don’t need a coach? Take advice whenever you can get it, listen to any coach who has something to pass along, and work with others to improve your skills. When you teach yourself it helps to have direction, correction, and feedback from outside sources to help correct and bad habits you may have established. For younger players this means asking questions from their coaches, attending power skating classes, and going to hockey camps if you can. Don’t be afraid to ask questions, or let the instructor know you want to work on something in particular. Another fun way for kids to improve is to watch NHL highlights, there are a bunch of them on Youtube. Don’t just watch the moves though, watch the positioning of the players, their habits, and the small things they do that help them get into position to score those pretty goals. 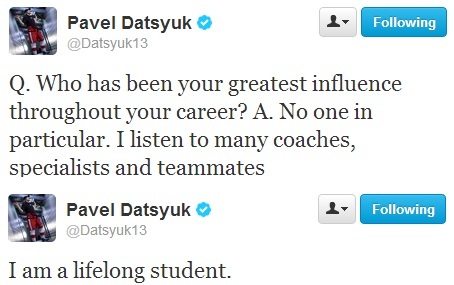 Just like Datsyuk said above, “I listen to many coaches, specialists, and teammates”. Your teammates may know you better than your coach. Make it a habit to talk to your line mates about how you are playing, how they are playing, and how you can play better together. This will allow you to improve your game, improve your teammates game, and also improve your chemistry together. What if I’m to old to have a coach? 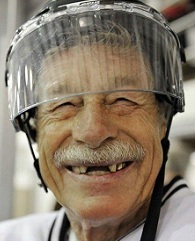 For older players this means reading hockey books, watching skill videos, talking about skills with other players, and attending adult skating lessons if they are available in your area. 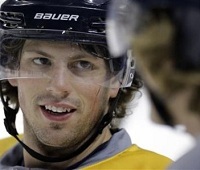 You can also watch NHL players and notice their habits and how they play and use that to guide how you play. Pay attention to the subtle things like how they get open, how they battle, when they use their speed, etc. I like to think of myself as an online hockey coach, so feel free to email me with questions and problems you face and I will do my best to help you. 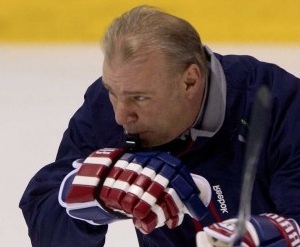 I recently published an article called the ultimate resource guide for hockey coaches. 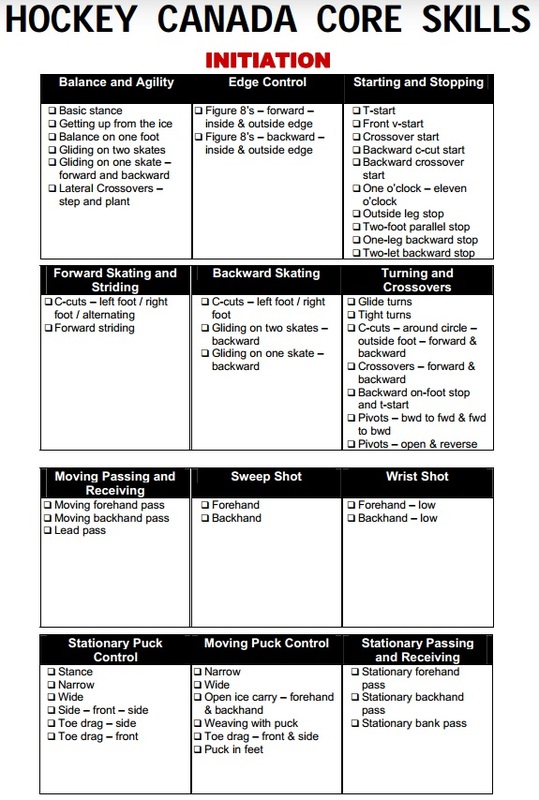 This guide can also be used by hockey players who want to further their knowledge of the game. There are links, downloads, books, and videos for everything from skill development to positioning and of course coaching. I really appreciate the core skills information — it looks a lot like the USA Hockey 1-4 list (or probably vice-versa). 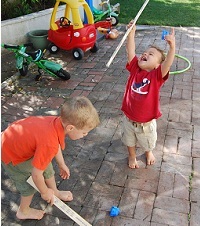 My nephew is just starting hockey, and I have been practicing and training with him, but it’s obvious to me that “showing” him is not the same as ” teaching” him. Have you considered making a beginners’ video demonstrating HOW to do these core skills? That would be a huge improvement over me chanting ‘watch my feet, watch my feet’. Also, I have no idea what ‘one o’clock – eleven o’clock’ is and suspect we call it something else. Just a thought — I suspect it would be valuable to a lot of people working with kids. Great article Jeremy!! I’m a older lifelong player that didn’t have the chance to attend camps or receive training when I was younger. 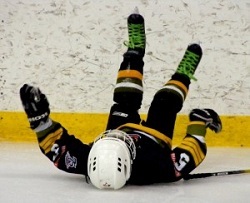 Everything I learned in hockey was on my own and through trial and error. Wish I would of had access to your incredible website back in the day. Now I am a father of a 3 year old son who is already working on his backward skating. We both really appreciate what you do. Thanks!! As a 42 year old, I just started skating and learning to play hockey since December of this last year. You are right on with this article. Each day I learn something new and look forward to what I improve each day. Thanks for posting this.